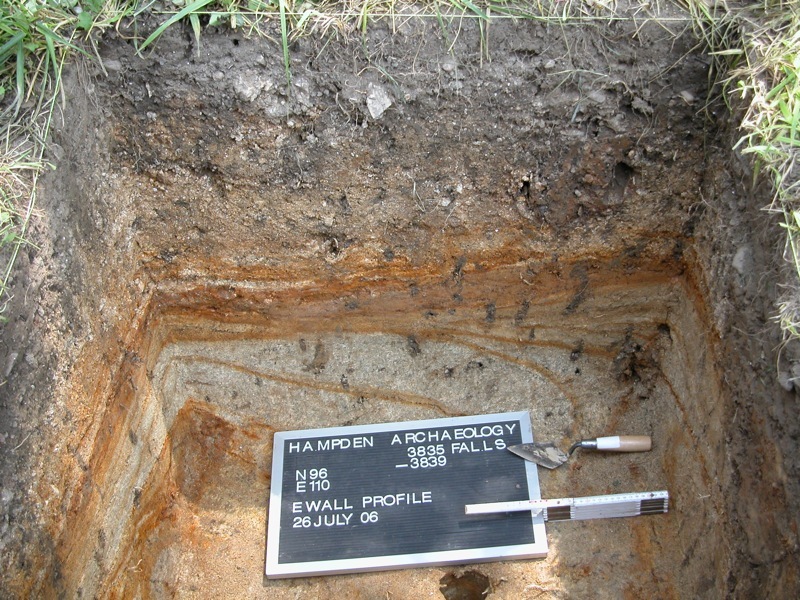 At the first place I ever did archaeology - Historic St. Mary's City in Southern Maryland - the lid of the site water cooler was decorated with the following motto: "Archaeology has been very good to me." I don't know who wrote it there, but I suspect my great teacher and friend Tim Riordan, who know that archaeology, even as it is full of frustrations, difficulties, and even boredom, has a way of renewing your faith in it just as you are about to plunge over the brink of dispair. During the first summer I worked with Tim, we spent weeks finding nearly nothing in a series of test pits that were meant to help locate new sites at the museum Tim, ever the exemplar of patience, taught me that summer that when you aren't finding anything, you have to console yourself with the satisfaction of practicing your craft well and the knowledge that, as any archaeologistst who hasn't been finding much lately will tell you, "negative information is good information." This kind of succor only goes so far however. Eventually working hard and not finding much begins to wear on you. Today was just such a day for me. I have to admit, I've been feeling a bit low about the project lately, questioning whether it was worth spending my summer making almost no money for a pursuit that may or may not produce enough usable data to allow me to write my dissertation. Indeed, I've also been digging in the same 1x1 meter unit for several days, and not finding very much besides large rocks which have to be mapped in place frequently - to my great frustration. So I, although I'm not a religious person, I was about to raise a prayer of anguish to St. Damisus this morning when the wall I was cleaning produced a length of pipe stem, which, to me, seemed like evidence that I wasn't totally wasting my time. From the same fairly deep stratum came a number of other good nineteenth century artifacts, including a piece of teapot, a bottleneck, and a fragment of wooden button. These are the sorts of artifacts that tell us a lot about what people did that they might not have ever written down. Artifacts are traces of the past, and it is the task of archaeologsts and other students of the past to piece those traces into meaningful statements about how people lived. After lunch, Bob, who had been profiling his very deep unit with two of our student workers, began excavation of a 1x1 in front of the hearth of the ruined foundation on the site. 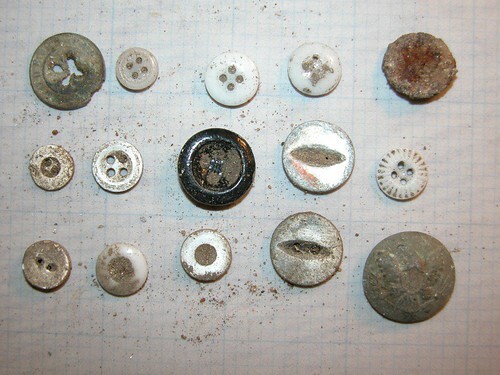 They had only been digging for a few moments when they found a mother of pearl button, and by the time the afternoon was over, they had assembled a pretty large bag of the kinds of artifacts that archaeologists of domestic sites like to see - buttons (15 of them! 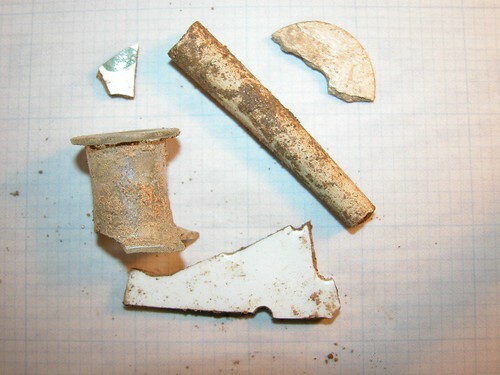 ), animal bone, ceramics, tobacco pipe fragments, glass container fragments, and even some bits of newspaper.